If you’ve noticed Alison’s Adventures has been on radio silence for the past little while, you’re not wrong; you’re just looking in the wrong place. I’ve actually been extremely active on social media—perhaps the most active I’ve ever been—but on a different platform. Because I’m now living in the Lower Mainland, working full-time for explore magazine. In November, my life plans were put on fast-forward. I was living in Montreal, happily working from home (aka in my pyjamas) for the same media company I interned with during my Bachelor of Journalism, when the opportunity arose for me to move back to B.C. for a full-time position. As fantastic as living in Quebec and freelancing was, it wasn’t taking me anywhere. I’d planned on travelling and living off my freelance income while balancing my long-distance Master’s program based in Halifax, but something inside me was starting to change. I wanted to make a career move. I wanted my first “real” job. And so, I find myself typing this after an eight-hour stint in my cubicle at the office. I know, I know. Me? In an office?! I can barely picture it still, yet here I am: clean hair, blouse, dress pants, jewelry. I still have on some backpacker bracelets, and even the fancy clothes can’t hide my lingering tan. The weirdest part about landing my dream job is that it’s a 9 to 5. And I really enjoy it. There are difficult parts, of course—even dream jobs can’t be perfect. Right now, I have a one-hour drive one-way from where I’m staying in Abbotsford. All that freedom to travel and go on last-minute adventures? I’ve gotta save those for Saturday and Sunday. Plus, finding time to write my memoir and study for my Master’s program… yeah, that’s pretty much been converted into meal prepping and sleeping. If there’s anything I’ve learned in the two weeks since I snagged my dream job, it’s that you have to keep making new dreams to keep the excitement alive. 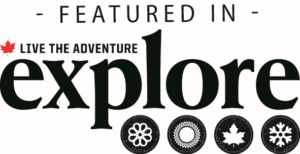 A conversation with my boss brought up the fact that explore magazine could use a female voice in their videos. I glanced around the room at my male colleagues and realized, yeah. As an Online Editor and Community Manager for explore, I’m in a unique position to reach females in the male-centred adventure world. How cool is that? Working for an outdoors magazine definitely encourages me to get outdoors more, too. It’s true, I only have Saturday and Sunday, but I’ve already tackled one hike and am planning another for this weekend. So even though I’m “settling down” a little now—not running from one corner of the globe to the other, really—I’m still going to be running Alison’s Adventures. I hope you’ll enjoy reading about my adventures within Canada, and hop on over to explore-mag.com to see the work I’m doing there too. Who knows—it might even inspire your next adventure.